In his poem “To Autumn” the English romantic poet John Keats described it as the “Season of mists and mellow fruitfulness.” He wrote that poem nearly 200 years ago but it is as evocative today as it ever was – the perfect description of fall! As we all enjoy this cozy time of year, making apple sauce and stocking up on the last of the bounty from the farmers’ markets, I wanted to share some of my favorite pieces in our online antiques and home accessory store that also celebrate the fruits of the harvest! 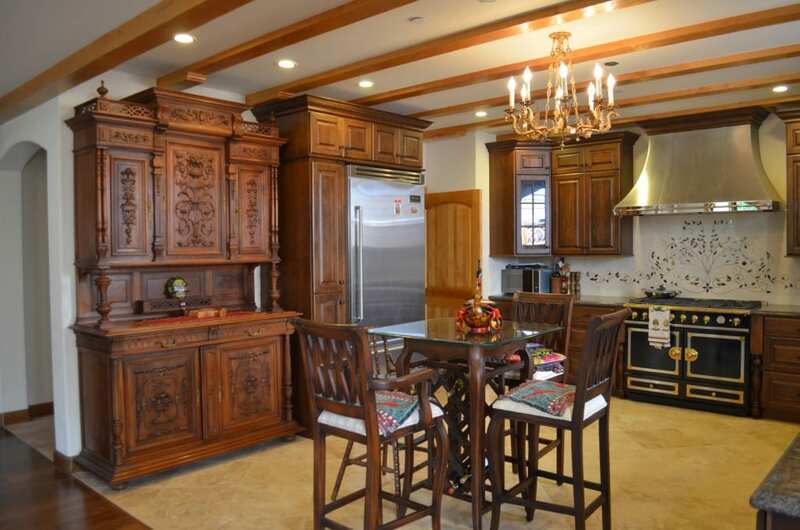 The buffet is carved across both the upper and lower oak cabinets with fruits and pretty bunches of grapes…. perfect for wine lovers! The close up of the door (left) shows just how lovely and detailed the carvings are. 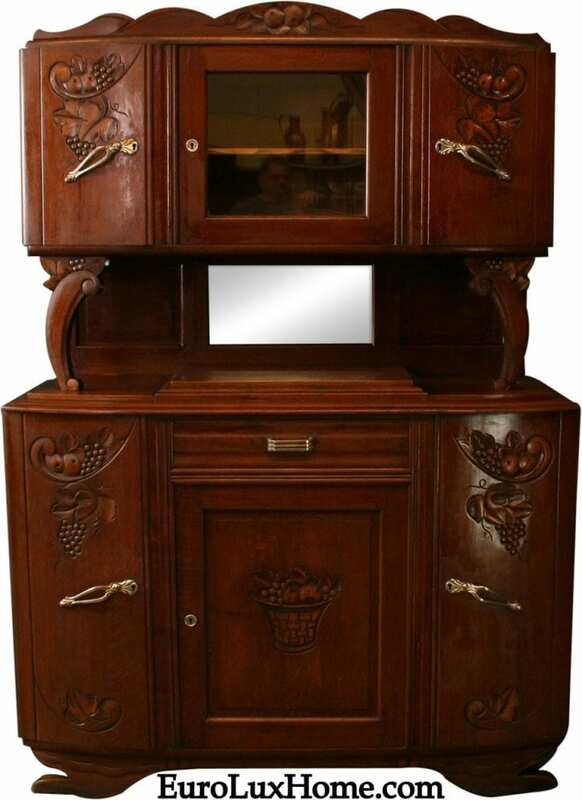 Accented by silver-toned handles, the Art Deco cabinet will make quite a nice centerpiece for a dining room or kitchen. Our customer Natalya S. showed us just how wonderful an antique buffet can look in a kitchen when she sent this photo of an antique Renaissance style buffet she bought from us, now starring in her kitchen in California! 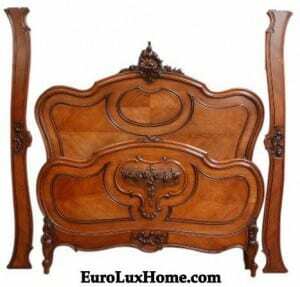 The French antique Henry II Renaissance style buffet dating to 1900 is crafted in walnut and it boasts elaborate carvings of abundant fruit. The design is ideal for a kitchen where the buffet also provides useful storage and display space. What a welcoming kitchen, and I bet it is especially cozy and comfortable in this fall season! On a smaller scale, this delicious new Aubusson throw pillow also helps us harvest the fruits of summer! 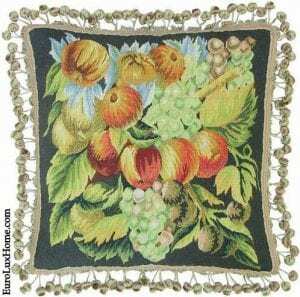 Crafted using traditional techniques in the style of antique French Aubusson pillows, the new large square Aubusson throw pillow is about 20 inches wide and it depicts luscious grapes and orchard fruits. The muted green background will blend beautifully into any color scheme and the bright fruit colors will add a warm accent. This vibrant hand-painted new Majolica ceramic bowl also adds a dash of color and a charming celebration of the harvest. 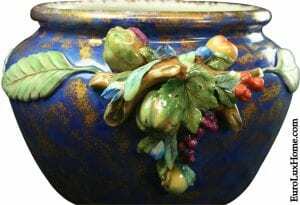 The bowl was crafted and hand-painted in Italy, and you can see the Italian love of food in the flamboyant design of harvest fruits and bunches of juicy purple grapes. The fruit is set off by large leaves spreading across the top of the stylish blue bowl. 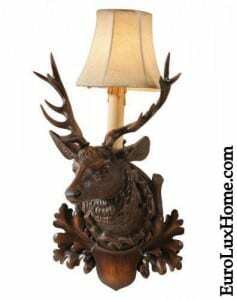 It measures about 13 inches wide and it would look terrific as a centerpiece on your rustic kitchen table. Welcome to autumn and I hope you enjoy browsing around our website to find other fall related furniture and home accessories. If you type a word into the search box in our EuroLuxHome.com online store — for example grapes, vines, fruit, flowers etc. — you will see lots of beautiful pieces appear! 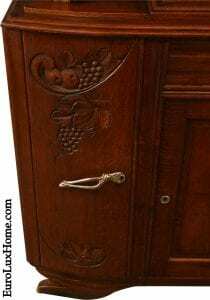 This entry was posted in Home Design Ideas and tagged Art Deco, Art Deco Buffet, ceramics, French Antique Furniture, fruit, Heavily Carved Antique Furniture, home decor accessories, kitchen, throw pillows, Vintage French furniture on October 14, 2018 by admin. My last post was about decorative ways to display a collection. That included vintage teapots, cameras, and model trains, amongst other collectibles. 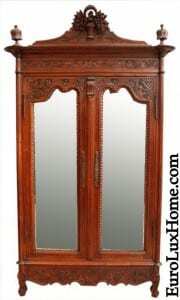 The Welsh Dresser style hutch that I showed in that post is a classic way to display china and ceramics – our antique buffets are great for this too! But today I’m sharing some other ways to display your ceramics collection. 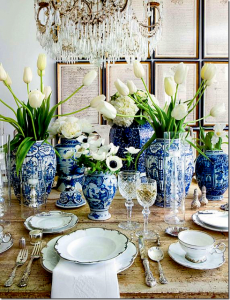 Blue and white ceramics, especially antique Delftware, always look fantastic grouped together. 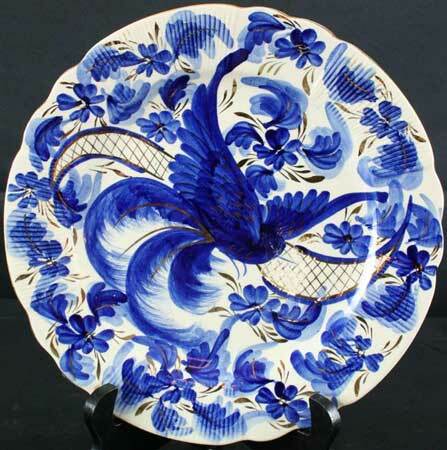 This photo from my earlier post about Blue and White Delftware proves it! Remember that if you have three or more of any one type of item – or even three or more different objects in the same color – you immediately have a collection. Group them together for maximum impact. This photo is also a good reminder to USE your ceramics collection whenever possible. Take your blue and white ginger jars and vases down off the shelf and flaunt them in a stunning table setting like this. Just add a few simple white flowers and wait for the admiring comments! 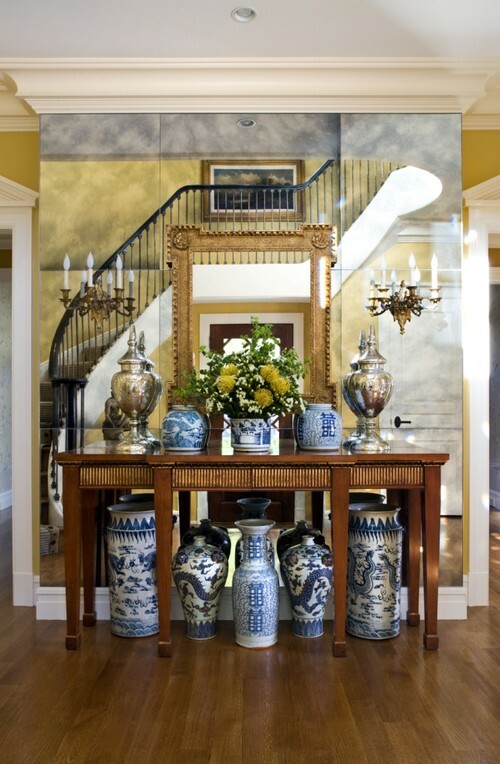 Traditional Entry by Washington Interior Designers & Decorators Sroka Design, Inc.
Usually you see blue and white vases and ginger jars displayed on a shelf or table, all on the same level. What I love about this photo is that the jars are clustered both on the console table and below it, creating more dimension in a double layer of visual interest. The tasteful blue and white looks crisp and elegant against the mellow wood table and flooring. Create a gallery display of your collection of plates to add a beautiful dash of color to a room. This example blends traditional blue and white plates in all shapes and sizes with some punches of lively red. It’s the perfect combination for the rustic beachy feel of this space, or for a breezy maritime look in an ocean cottage. Before hammering any nails in the wall to hang plates in a gallery display, it’s best to get your layout arranged. Place the plates on a large table or on the floor for a test run! Looking for a completely different way to display your collection of plates? The creative couple in this 1980s ranch style home used an antique picture frame to show off their plates. The picture frame is about four feet wide and the flourishing silhouette makes a focal point of the plates. I think this display would look fabulous with our vintage teacup and spoon chandeliers! To finish up this mini-series about displaying your collections, I’ll be back soon with a post about storing and displaying jewelry in creative ways to enhance your home decor. If you’ve got any examples of great ways to display your ceramics, jewelry, or collections of anything else, send them my way! 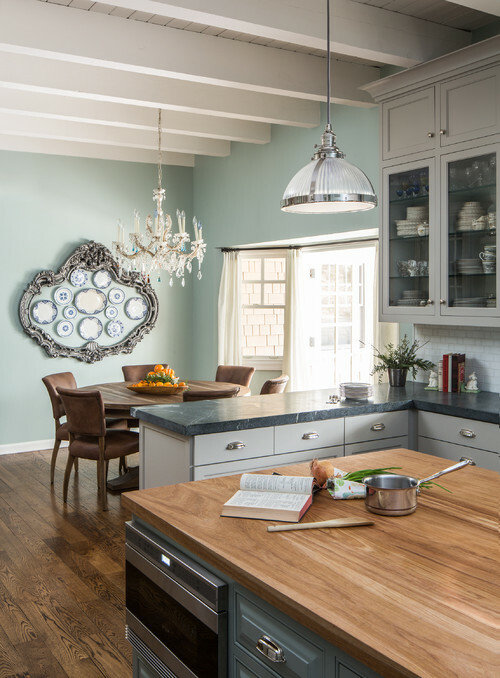 Tell us in the comments or on our EuroLux Home Facebook page! 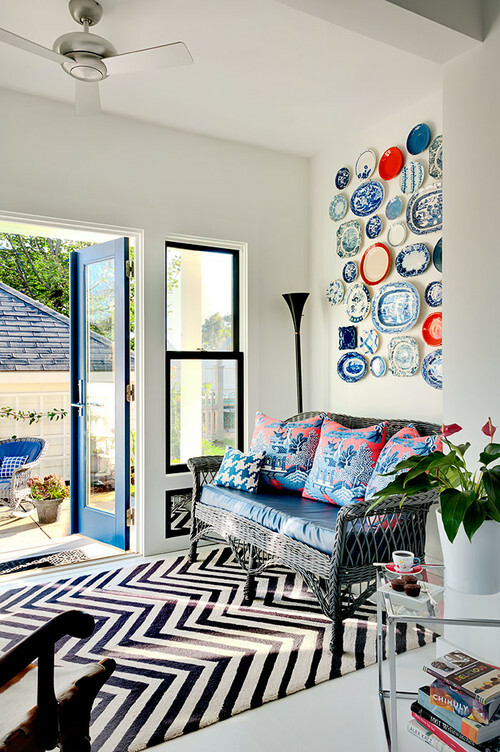 This entry was posted in Home Design Ideas and tagged Antique Blue Delft, antique ceramics, Antique Delftware, ceramics, creative home decorating, design ideas, design inspiration, display a collection, home decor, interior decor, interior design on June 15, 2015 by admin. 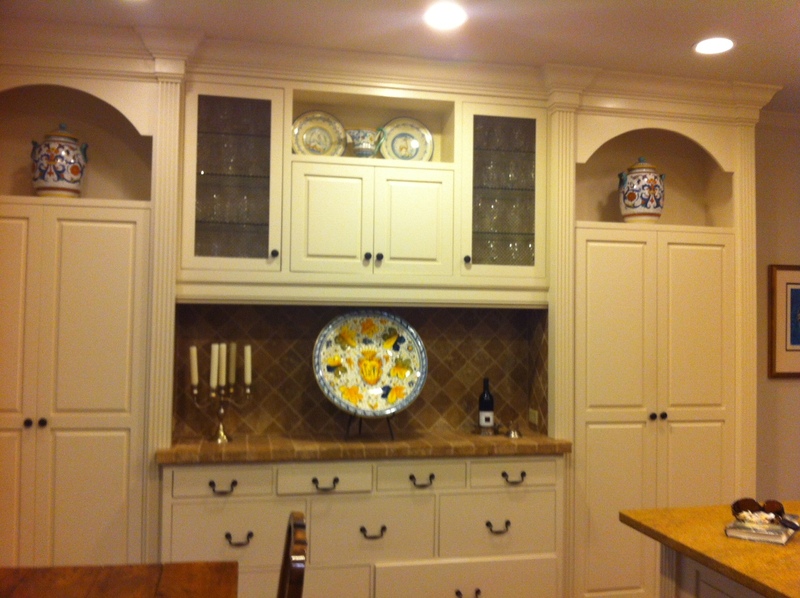 Our customer, Bunny J., in nearby Chapin, SC, sent us a photo of her kitchen decked out in Italian vintage Deruta ceramics from EuroLuxAntiques.com. Bunny has been a great customer for many years. 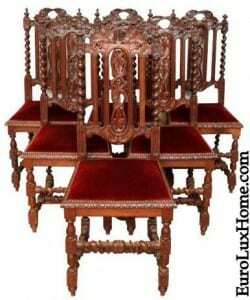 In the past she’s purchased an armoire, a set of 8 chairs, and lots of vintage majolica and pewter pieces. I love how Bunny has created a nice sense of balance with her display of ceramics. That large yellow and blue plate is a cheerful focal point in the attractive tile nook. Old hand-painted majolica always adds a welcoming note in a kitchen. While Capodimonte is probably Italy’s most famous porcelain manufacturer, collectors in the know also look out for vintage Deruta majolica. This vintage Deruta pot is a nice example, and it’s one of the antique and vintage ceramics and majolica pieces in our gallery right now. 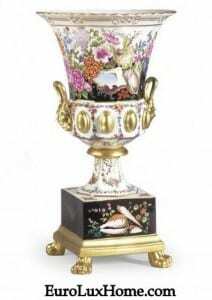 Majolica means a hand-painted earthenware pottery with a tin glaze and it is named for the Spanish island of Majorca. The style spread to Italy, including to the medieval town of Deruta in Umbria. The local clay around Deruta was so good for ceramics that craftsmen were firing up their kilns by the early Middle Ages. They really hit their artistic stride in the 15th and early 16th centuries. 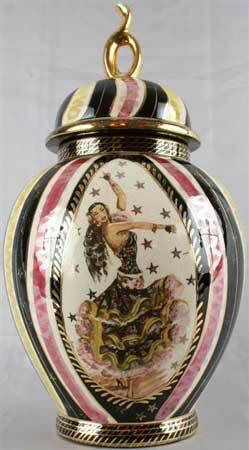 The vintage Deruta pharmacy pot dates to the 1950s, hand-painted with a Renaissance design. It was found in a European antiques market. 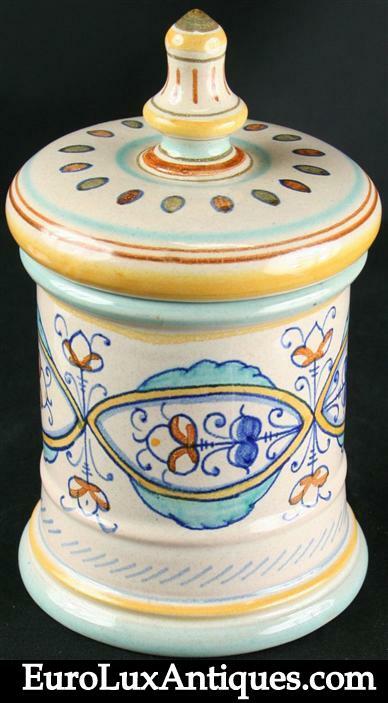 We think it would be lovely in a kitchen as a canister for flour, sugar, salt, or spices. I can’t resist showing you this incredible Italian fountain that we have in the gallery too. Deruta ceramics are still being made and although the hand-made fountain is not vintage Deruta it is a beautiful example of the style. When I first saw the fountain, I was delighted by how very Italian it is in spirit. How can we see the lemons and grapes on the fountain and not think about living La Dolce Vita? The fountain looks like a pedestal sink, but really this colorful new hand-painted fountain is meant for a garden, patio, porch or sunroom. It’s more than 6 feet tall – that’s a lot of Italian style! . 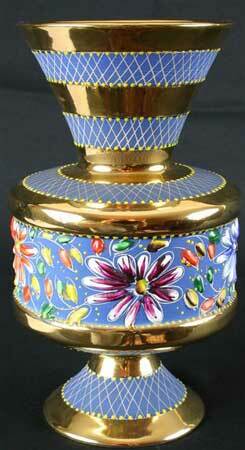 The use of blue, orange and yellow are also typical of Deruta majolica. Those sunny Mediterranean colors always bring a smile to my face and they perk up any space. Thanks to Bunny for inspiring us with the vintage Deruta ceramics in her kitchen! 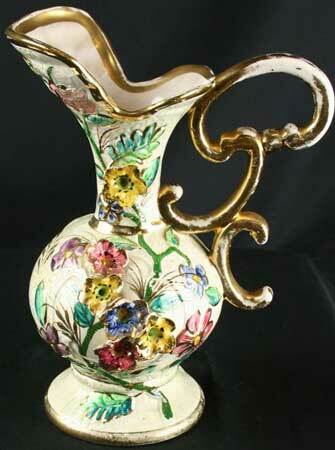 If you have any old (or even new) Deruta majolica, I’d love to hear what you like about it. Tell us in the comments box below. This entry was posted in Client Spotlight, Learn History & Styles and tagged antique pottery, ceramics, Deruta ceramics, home decor accessories, Italian vintage ceramics, vintage Deruta, Vintage majolica on April 3, 2014 by admin. Oops… crash! Do you have any broken ceramic items lying around the house waiting to be repaired? We’ve got some tips so you don’t have to put the job off any longer! Greg’s mom Kathy is our Director of Restoration Services and she is a certified expert in fine ceramics restoration. Kathy made this video with tips on how to fix your broken ceramics. The item Kathy repairs in the video is a broken ceramic figurine, a.k.a. Prudence. The large figurine was shipped from Europe to a friend of ours and it arrived with a broken arm. Our friend asked Kathy to take a look at Prudence and see if she could do a repair on the poor girl’s arm. Of course, if EuroLuxAntiques.com packed and shipped this figurine (or any other antique ceramics in our gallery) it would not arrive broken! 1. Kathy says that before starting with the glue, make sure you have paper towels handy as you will definitely need them. 2. Then she starts by looking at the broken surface to see what kind of glue is needed to repair it. She rubs the broken edge with a toothbrush and sees that some powder comes off it. She also sees a few little air holes. This tells Kathy that it’s a soft paste with a lower firing temperature than some other ceramics. 3. With that information she chooses a white glue. The scientific name is polyvinyl acetate (PVA). Elmer’s white glue is the brand Kathy’s prefers. It goes on white and becomes clear as it dries. Note that white glue is water-soluble. It is unlikely that anyone will ever need to put Prudence in water… she’s already suffered enough! But if you do fix a broken ceramic with white glue, you must remember not to soak it later otherwise it will come apart. 4. If there is already glue on the raw edge from a previous fix, you need to clean that off or the new repair won’t seat perfectly. 5. Kathy uses a cardboard box to put the item in and support it while she works. This trick means that gravity does the work for you. The broken ceramic remains stable as it is lodged against the sides of the box. Prudence is a large figurine so Kathy got a banana box from a grocery store. If you have a smaller item to mend, then you would choose a smaller box. Now the stage is set… let’s get on with the show! Kathy places the figurine so it balances and is lodged perfectly in the box. Before placing the arm, she is careful not to scrape the broken edge of the piece around too much. She doesn’t want to loosen particles that will interfere with the seating of the piece. Next, Kathy applies glue all around the edge of the piece. Some people say to put the glue on both edges of the break – the broken piece itself and the main body you’re attaching it to. Kathy doesn’t usually do that unless it’s quite a wide break. But she does recommend applying the glue all around the edges of the break and then putting some glue down just inside the rim of the break. Then when she places the arm back on the figurine, the glue will run down on the inside. It covers the break on the inside too and gives a little extra strength to the repair. Once the arm is seated, Kathy wipes off any excess glue spilling on the outside. Then she presses the broken pieces together as hard as she can for about one minute. “That helps it to heal,” she says. (You can tell that Kathy was a nurse in the U.S. Navy. She worked in that profession for 35 years!) Because white glue is water-soluble, she can go back later once the glue has dried and easily clean off any other excess glue. So now you know how to fix your broken ceramic items. Let us know how it goes or ask any other questions in the comment box below. Kathy also gave some great tips on deciding when to leave antiques repairs to a professional and when to tackle it yourself in our blog post: When It Breaks: DIY or Professional Restorer? 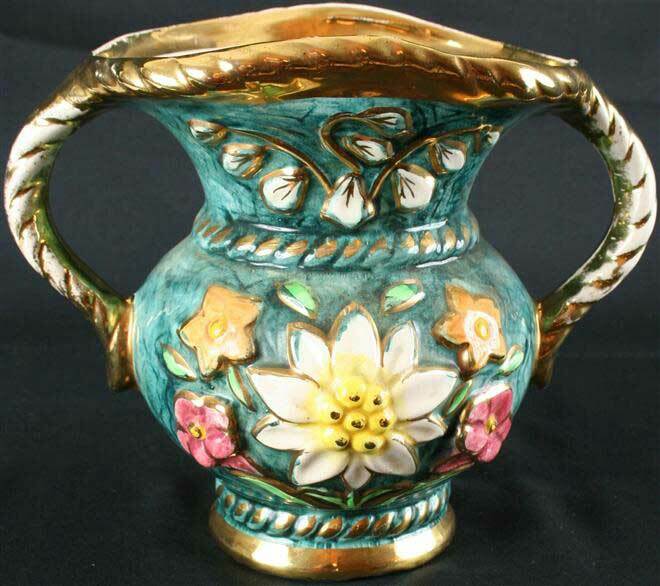 This entry was posted in Restoration Tips & Tricks and tagged antique ceramic restoration, antique ceramics, broken china, broken vase, ceramic restoration, ceramics, do-it-yourself on September 3, 2013 by admin. When It Breaks: DIY or Professional Restorer? We’ve all felt that horrible sensation in the pit of our stomach when a treasured piece of china crashes onto the floor. Did it break? How badly is it broken? Can we salvage it at all? Whether the damaged item is a cherished antique Blue Delft vase or an antique Belgian dining chair, it can be difficult to decide how to proceed. Some repair or restoration projects are do-it-yourself in nature, while others perhaps should be left to a professional. As you might imagine, we do quite a bit of repair and restoration work around here. Not every item that arrives in a shipping container from Europe survives the trip unscathed. Thankfully, we have Greg’s mother, Kathy, to perform expert repairs and restoration on items that need tending. By the way, if you ever have a question as to whether we’ve repaired or restored an item in our inventory, please don’t hesitate to ask. Usually, we tell you right in the description, but I’m never offended by questions! Because ’tis the season when glass and china items get dropped, knocked off the shelf, or otherwise broken, I asked Kathy for some tips on how to decide when to use a professional restorer. We focused on ceramic items because Kathy is a certified expert in fine ceramics restoration, as you can tell from this photo! The value of an object after restoration should be the same as it was before the object was broken. If the cost of repairs will be significantly more than the item is worth, you might want to try repairing it yourself. Obviously, you wouldn’t want to professionally restore a $2 coffee mug. And sometimes you can go on Replacements.com to find china pieces for a fraction of the cost of a professional restoration. You may feel an heirloom item is worth professional restoration, regardless of the cost. That’s OK. If you have a piece you want to continue to pass down through the generations, and if you can afford the cost to have it restored, then why not do it? Most professionally restored ceramics cannot be soaked or washed in a dishwasher. This means a repaired object must be relegated to decorative status. If you’ve broken a utilitarian piece, such as a dinner plate, you may want to check other sources for a replacement rather than trying to repair the piece. If, on the other hand, the broken object is a vase, you may wish to proceed with the repair even though you know you won’t be able to display fresh-cut flowers in it anymore. It’s also worth noting that Royal Doulton and Dux items usually cost more to repair because cracks tend to “travel” during the restoration process, making the whole thing trickier and more time-consuming. If you have any questions about professional ceramics restoration, we’re always happy to chat with you by phone! This entry was posted in Restoration Tips & Tricks and tagged antique ceramic restoration, antique ceramics, Blue Delft restoration, Blue Delft vase, broken china, broken vase, ceramic restoration, ceramics, do-it-yourself on December 20, 2012 by euroluxantiques. Hubert Bequet began creating beautiful ceramics in 1926 at the Belgian ceramics manufacturer Auguste Mouzin et Cie (AMC). (This manufacturer was later renamed La Faencerie de Wasmuël, which operated from 1878 to 1951 in the southwest coal-mining region Borinage region of Belgium.) AMC was known for fine quality ceramic pieces and specifically for their 1910 introduction of mass production ceramic mantle clocks. Bequet opened his own ceramics production factory in 1934 in Quaregnon, incorporating everything he had learned at AMC. The apex of success for the factory was in 1963 when it employed 150 workers, but eventually closed its doors when the pottery and its director then began to experience various problems. The large factory closed in December 1982. Hubert Bequet did however continue to produce pottery in a small workshop, “The Ceramics of Borinage”, until April 1985 before closing for good. Below is a slideshow of sample Bequet work. This entry was posted in Learn History & Styles and tagged antiques, belgium, bequet, ceramics, South Carolina on January 12, 2012 by euroluxantiques.